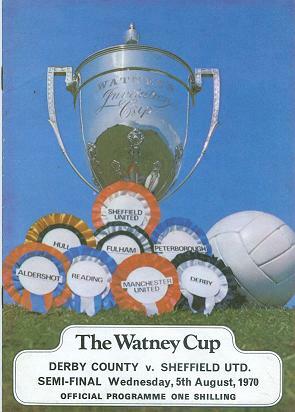 The Watney Mann Invitation Cup (normally referred to as simply the Watney Cup) was a short-lived English football tournament held in the early 1970s. It was held before the start of the season, and was contested by the teams that had scored the most goals in each of the four divisions of the Football League the previous season who had not been promoted or admitted to one of the European competitions, although Manchester United did not compete in the 1972 event despite apparently having been eligible based on goals scored. Two from each division took part, making eight participants in total. The competition was a straight knockout format, each match was a one-off with no replays. The final took place at the home ground of one of the finalists, rather than a neutral venue. The competition was so named thanks to a sponsorship deal with the Watney Mann brewery. It was the first tournament in England to sell its naming rights. The tournament ran four times, from 1970 to 1973, before being discontinued. The first ever penalty shootout in England took place in a semi-final of the 1970 tournament between Hull City and Manchester United, and was won by Manchester United. The first footballer to take a kick was George Best, and the first to miss was Denis Law, whose attempt was saved by Hull goalkeeper Ian McKechnie. McKechnie became the first player to miss a deciding kick, when he shot wide after taking the fifth kick for Hull in the shoot-out. For details of the Watney Cup final results click here. For details of each season's results or your club's Watney Cup results click here. For details of Watney Cup semi-final appearances click here.